My book is in it’s second printing! Thousands of people have bought this book! Wow. So humbling. 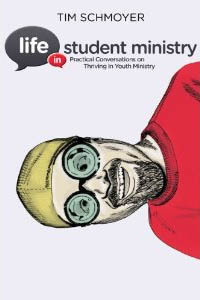 Last February when I learned how many copies were published of my book, “Life In Student Ministry: Practical Conversations on Thriving in Youth Ministry,” I remember thinking to myself, “Wow, it’ll take years to sell that many.” But then yesterday I got a letter in the mail from Zondervan saying that my book just went through its second printing! They were nice enough to include a copy of the book from the second batch, too, which is cool. When I finished writing the book about a year and a half ago now, I thought it would sell a couple hundred copies and eventually, over a lot of time with a lot of accidental random purchases by random people, it might eventually hit the quota Zondervan printed, but I never expected a second printing after only 5 months. That’s crazy! That means literally thousands of people have bought (and possibly read?) my book, and there are more to come? Wow. That blows my mind. So anyway, to celebrate the second printing, I’m going to keep the price of 30% off active in the LISM store for a little while longer. Since I can buy my book from Zondervan in bulk using my author’s discount, I can pass that savings along to you guys and make it cheaper than anyone else can. (I’m even cheaper than Amazon.) I don’t make much money on it priced at only $8.95, though, so I’ll raise it in a little bit to make some breathing room in the profit margin. Until then, get it for only $8.95! Easy way to win a signed copy of my book!